Hair is closer to waist length than I thought. My thumb on the right is where my natural waist is. Should be fully WL by year end. I was thoroughly disappointed. But I quickly realized that my hair on its own could rock box braids. I previously did them on a regular basis when I was pregnant with kiddo #1. Not sure why I fell off…they led to a lot of length retention. 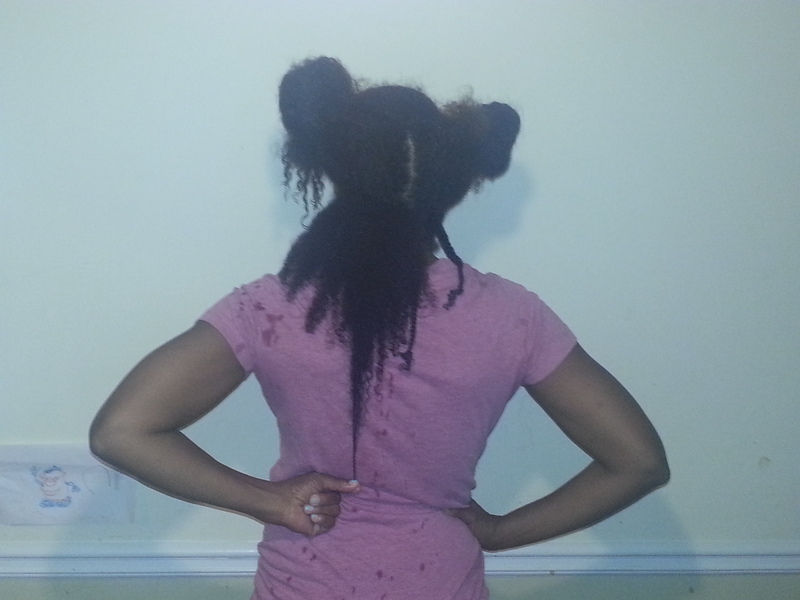 In addition, its a protective style without the added tension that comes from adding hair. These are just pulled back and secured with a bobby pin. And so, they are back. Box braids without extensions. I started with freshly washed and detangled hair. I spritzed each section with water, then coated strands with Oyin Handmade Honey Dew, and finally sealed with shea butter before braiding. To preserve, I have been spritzing my hair lightly with plain water, shea butter over the roots, and tying down with a silk scarf at night. This has kept the frizzes at bey. I have also made sure to spritz and seal my ends every other night. 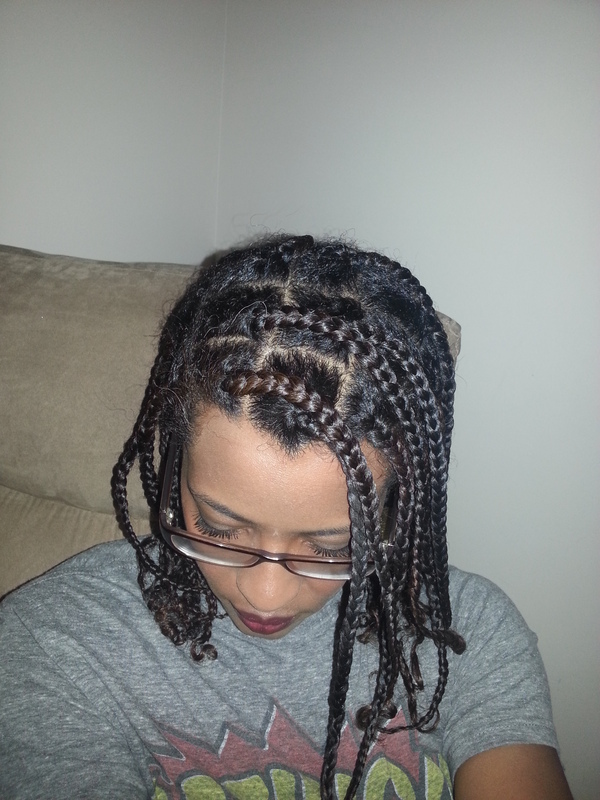 I decided to create my own little protective-style-self-challenge. In a perfect world I would love to keep these in for about 6 weeks, but realistically speaking, I want to start with keeping in the same set of braids for stretches of 3 weeks, separated by 1 week of rest and deep conditioning. August 2nd marks the end of a 3 week period. I might have to make some adjustments as I start a new rotation on August 4th, but for now, I’ll just keep spritzing and sealing. Anyone rock box braids with their own hair on a regular basis? How long do you keep them in? What’s your regimen? Soooo, I’m really contemplating getting some box braids. Not because it’s the latest trend (especially since most of us long term naturals have been there & done that and are on round 2 of the “trends”), but because I really need to get back to protective styling. 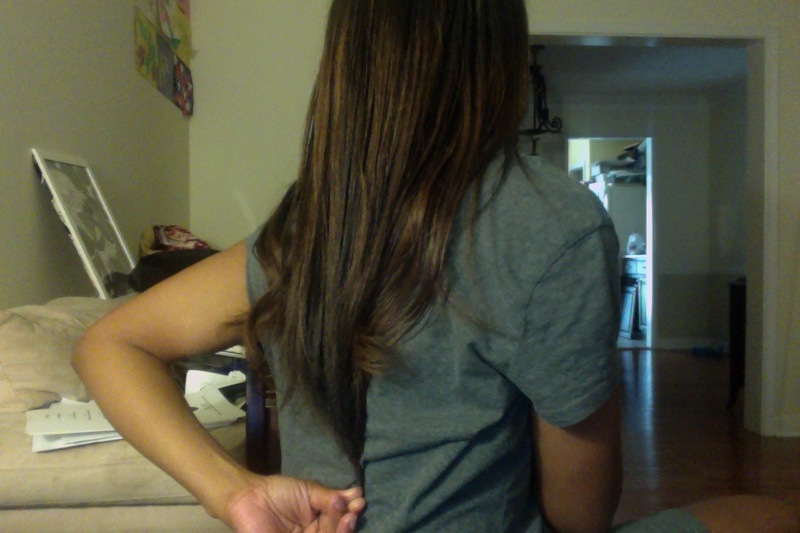 My hair grew and retained the most length when I was dedicated to protecting my ends. I was past waist length at the end of 2013, an over-the-hill trip to waist length, and I had a stylist beg me to even out my hair, even though I said, “Don’t even out my hair, I don’t care about that.” Nevertheless, I punked out (to put it nicely) and now I’m hovering between MBL and WL. Remember, always trust your gut and stick to your guns, especially when it comes to natural hair. Smoke and Mirrors from The Body Shop??? More on this later. I’m taking the PCAT this Saturday and don’t have the time to fully do any sort of analysis any justice, but I at least wanted to highlight a comment on the subject, so that people can at least start to wonder/research on their own. The Marxist in me is unhappy. Hmmmm, I am going to have to do some major research. This is disheartening. I’ll have to highlight this in a post so that others can see. I understand the capitalistic world we live in is full of exploitation. But I’m not so understanding when it comes to companies using a cloak of “green practices” and assistance to the underserved as a simple marketing ploy. Not cool. Folks, take note of the above link. I’ll be back with more thoughts (after I take the PCAT on the 19th and can dedicate something more than a flow of consciousness). Soooo, I bit the bullet last night. 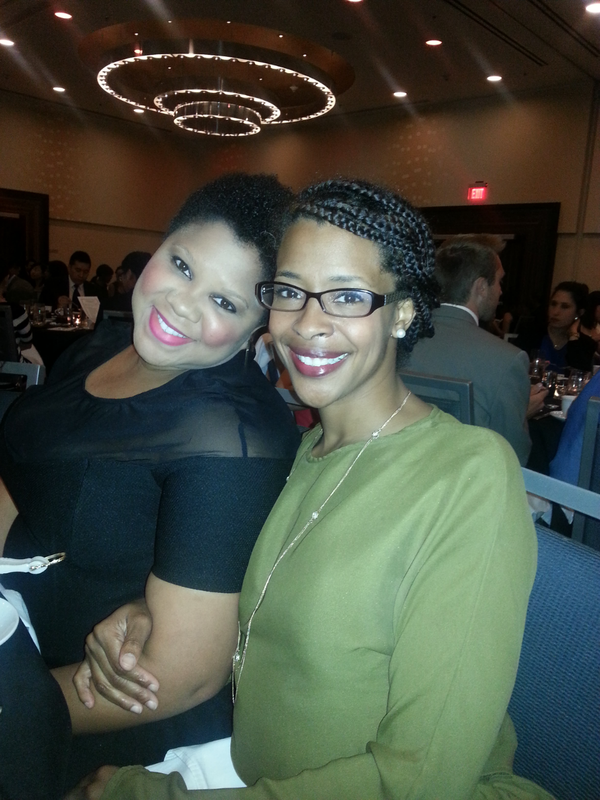 I actually did what I said I was going to do…and that is a head full of cornrows. At first, she start doing a pattern closer to the pics of Alicia that I posted yesterday, BUT, I did NOT like it AT ALL. I feel like the swirly pattern made my head look…bigger. Bigger than it already is. So I asked her, in the most gracious way that I could, if she would start over and go back in a more straight forward (ha!) pattern. And so, we came to what you see below. Here’s the kicker. It only took 2 hours. That’s right. 1. 2. That’s it. I am in love for sure. Once a month, I will be going back to get my hair re-done. I will be living in cornrows for the most part until the end of the year. You just can’t beat the ease!!! 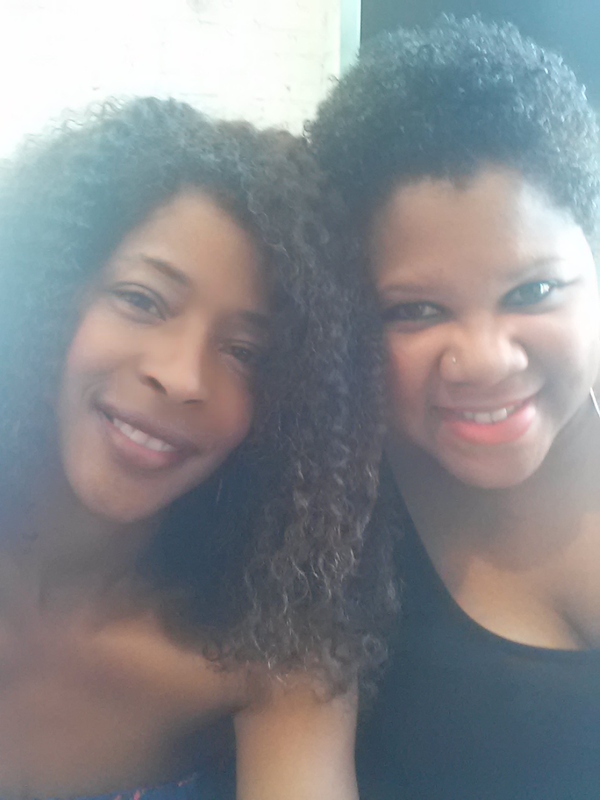 My Braider, Kady – on 5th Ave between 125th and 126th – was EXCELLENT. The braids are taut, but not overly tight. She was very gentle on my hairline, and I don’t feel any tension there whatsoever. The little bit of tension that I do feel is more in my crown/top area, which is fine. I plan to wear a scarf every evening, to minimize the frizz. We’ll see how that goes. Then, in the morning, apply coconut oil to my ends every day, and the braids every other day or as needed. Add a little SSF for moisture as needed as well, and viola! That’s it. I’m about to venture into the world of cornrows for the summer. This pregnancy has sent the thickness of my hair to a world never before experienced. My hair thickened with my first pregnancy, and then thinned out a little with the postpartum shedding, but never, ever went back to its original density. Going into pregnancy #2, I was already dealing with a thicker forest, and it is just getting thicker, and thicker, and longer, and thicker. I had a trim, which ended up being a mini-cut a few weeks ago, and I would say I’m about BSL at the moment. Which is fine with me. My ends needed it. But I am seriously at my wit’s end. 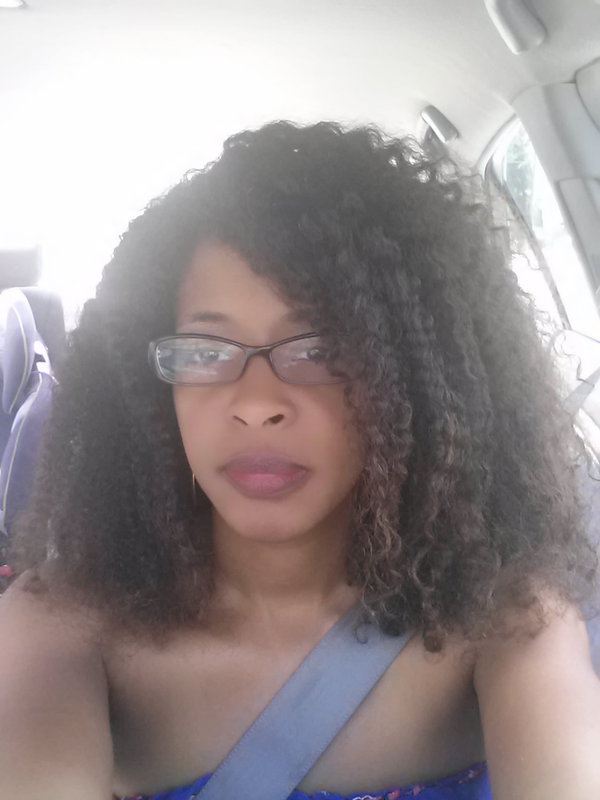 Styling crazy thick, and relatively long, natural hair is a chore. No way around it. For those of you that do it on a daily basis, I’d love for you to chime in with comments so we can share options with each other. The more the merrier! Buns, buns and more buns. I was doing this for a while. But I have a big head y’all. I don’t have hair that easily slicks back into an elegant chignon. I have THICK hair that I have to beat into submission in order to get anything that remotely resembles a smooth bun, without having humps and lumps that work against what I’m trying to achieve. My buns tend to make my head look that much bigger because my hair is so thick. Needless to say, it’s been my fallback style, with a scarf or headband added. It still takes me about 20-30 minutes of wrestling to get it looking decent, at best. But I feel the tension I have to create to get it all back is just not good for the hair line. Mini twists or braids that would last about a week to 10 days that I could turn into a twist out. These were good for a while. But I just don’t have the 4 hours it takes for me to put them in. End of story. Wash-n-gos. Ha! 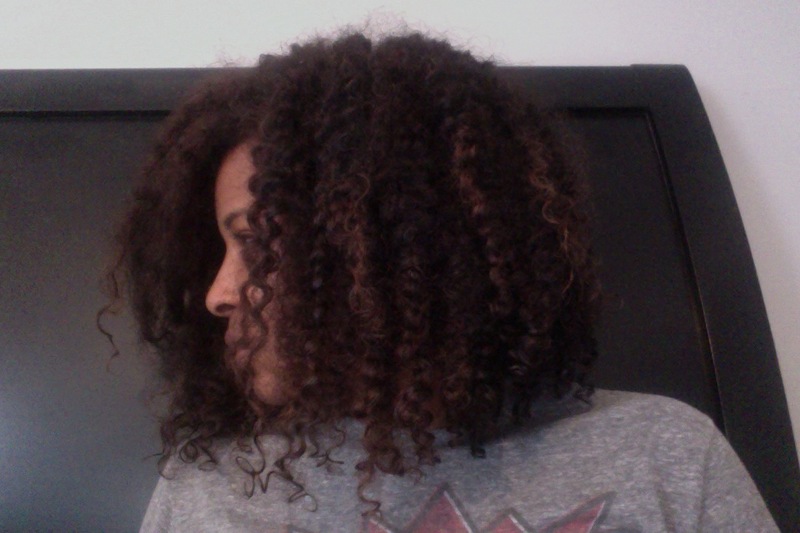 The last time I did a wash and go was in my last post…how many months ago was that? 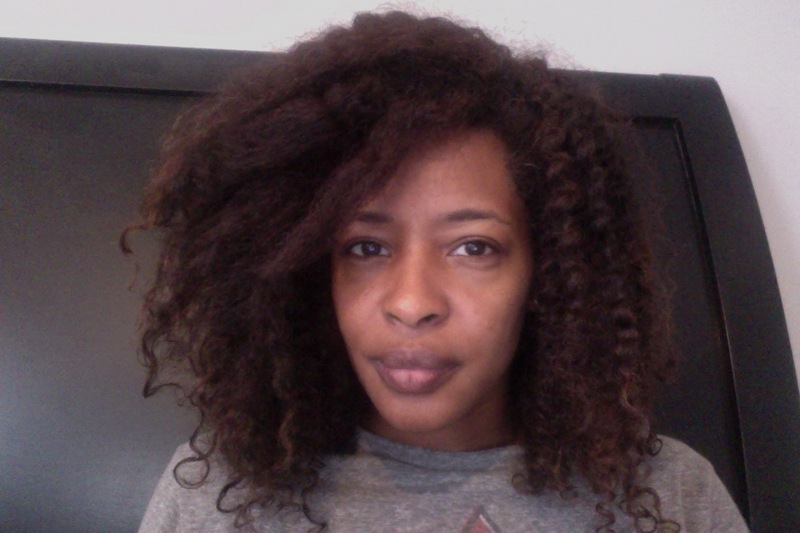 I choose not to do styles that “bring out my curls” because it requires a lot of product and manipulation on my part. I’m okay with my fuzzy kinks. 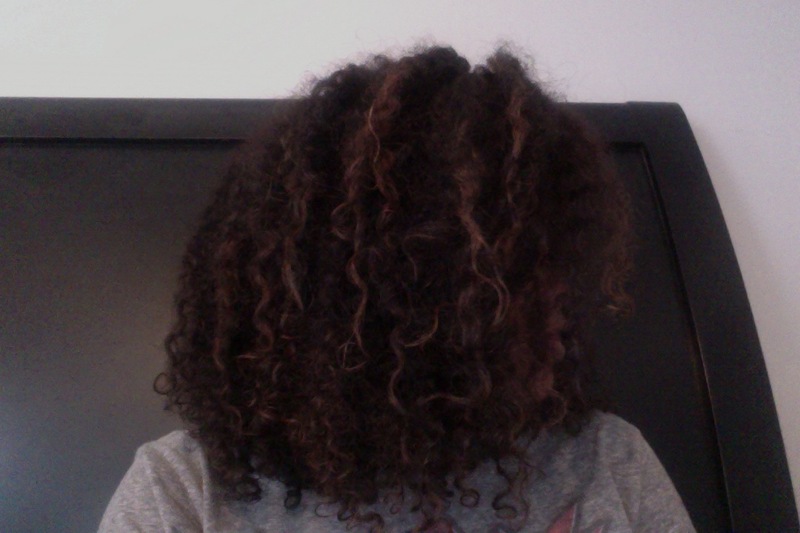 The time factor (washing, conditioning, detangling and styling) combined with complete acceptance (I just don’t need to prove to the world that my hair has waves and curls) leads me to just not really prefer this option. Sure, it’s okay to throw it in there every now and then as an alternative/switch it up…it’s just not the go to. Relax it. Not really an option for me. But I would be lying if I said it wasn’t something I hadn’t considered from time to time. That’s just real talk right there. No frontin’ on these pages. So, after lots and lots of deliberation, I came to realize I was tired of every option I had ever given myself. But then I opened my eyes to an option that had always been there that I never really considered. Cornrows. I live in Harlem. Without fail, like clockwork, every single day when I come home, I am greeted on 125th street with the songs of West African Braiders. “Hair braided Miss? Hair braided?” I usually reply, “No thank you. Not today. But have a nice day.” To which I get smiles and “Take my card for next time.” And I do and I put it in my bag and never really think about it again. Then yesterday, as I was digging around looking for my keys, I realized I had at least a dozen cards from hair braiders in my bag. On the front of one was a picture of a woman was really small cornrows that were quite beautiful. I took the card to my DH and asked what he thought of the style, and he said “That’s kinda hot” and I smiled because I thought the same. 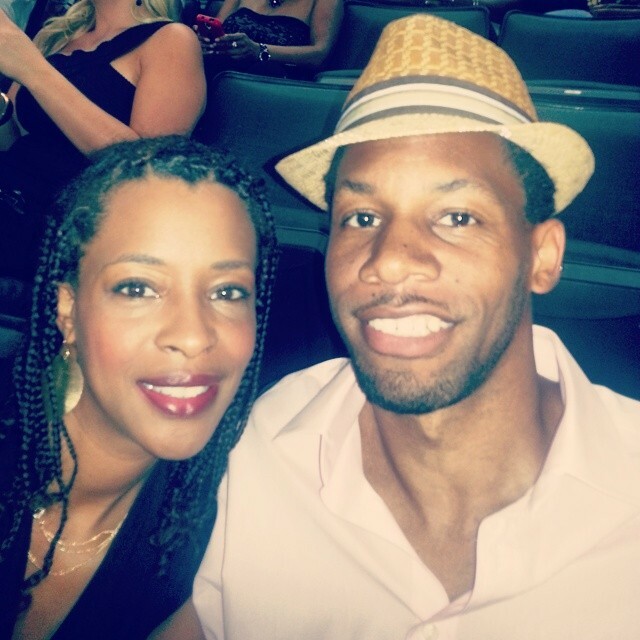 So, I started scouring the internet for pics of cornrows. And all I could find were larger sets or styles with extensions. None of which appeal to me. And then I came across A. Keys. And I found the style I want to [try to] have replicated. I’m getting it done with no hair added, no feed in, just my good old thick, natural hair. They quoted my $60, which I thought was a great price. If it comes out nice, I’ll probably throw in another $20 for appreciation. Getting it done this evening after work and I’ll report back with the final product.